← That hokey-pokey, birds of paradise mating dance of the Democrats and Republicans. And guess who gets screwed in the end? A Gallup Poll conducted between May 6 through May 8 indicates that the Osama bin Laden raid gave President Obama a little bump in his approval ratings, showing that 51% of those polled approve on his job overall as President while 40% disapprove. The results reflect a modest rise of about 5% attributable to the Osama bin Laden raid and killing. Although most pundits feel that this 5% bump will fade, it may make a big difference for Obama going forward since it involves national security. Why? Because future Republican attacks on Obama on National Security will not work since the public knows that Obama was the guy who got Osama bin Laden. 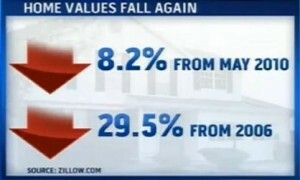 So the poll results is good news for Obama overall. 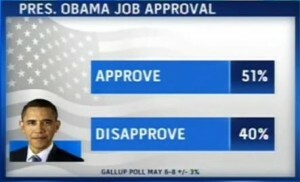 But there was bad news in the very same Gallup Poll for Obama as well. Only 34% of those surveyed approve of Obama’s handling of the economy–the lowest number of his presidency! Obama misjudged badly how to solve our economic problems. He went with this trickle down theory: that if we give breaks to the corporations and the banks, that’ll trickle down to us. Well, the corporations are doing great, we’re seeing that over and over, the stock market’s back up, bonuses are going through the roof for CEOs, but unemployment is still at 9%. 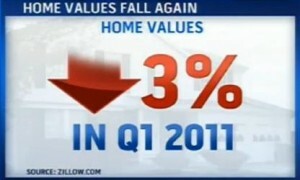 Data provided by zillow.com show that home values fell 3% in the first quarter of 2011; they’re down 8.2% from May, 2010; and they’re down 29.5% since their peak in 2006. A stunning 28.4% of all single-family homes are now “underwater”, which means that people owe more money on them than what they are worth. Now that’s now all Obama’s fault. The problem started in 2006 and went through all of 2008. But how do you address that? All that takes money out of consumers pockets. Those are the things that affect real average Americans, and it’s dragging down the economy. Unfortunately, we did not fix that underlying problem. We went with the theory that if we give money to the businesses, tax cuts to the businesses, and bail outs to the businesses, that it will come down to us. But it didn’t. 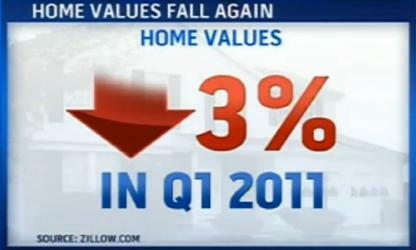 And that’s what’s pretty bad news for President Obama. And he’s got to address that as quickly as possible. 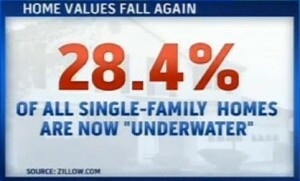 This entry was posted in Accountants CPA Hartford, Articles and tagged 28.4% of single-family homes underwater, 34% approve of Obama's handling of the economy, Housing values have fallen 29.5% since 2006, President Obama's misjudged the handling of the economy, President Obama's tax cuts and bailout and giving of monies to corporations did not trickle down to Americans, President Obama's use of trickle down economics has failed to reduce unemployment. Bookmark the permalink.